I’m not ready to leave summer behind but I’m so in the mood for some comfort food! I had originally planned to make this meatless, but decided to throw a little bacon top for some crunch. My husband and I liked it, but no luck with my daughter. I guess she’s allowed to be picky every once in a while. In a large dutch oven, heat 2 tsp of olive oil. Add 1/2 cup onions, celery and squash and saute 8 minutes or until vegetable are tender over medium-high heat. Reserve 1 cup of corn and set aside. In a blender, add the remaining corn and 1 cup of milk; process until smooth. Add the remaining milk, thyme, salt and pepper to blender and combine until smooth. Add the pureed mixture and reserved corn kernals to pot. Reduce heat to medium and cook 5-7 minutes or until throughly heated, stirring constantly. Season with additional salt and pepper. 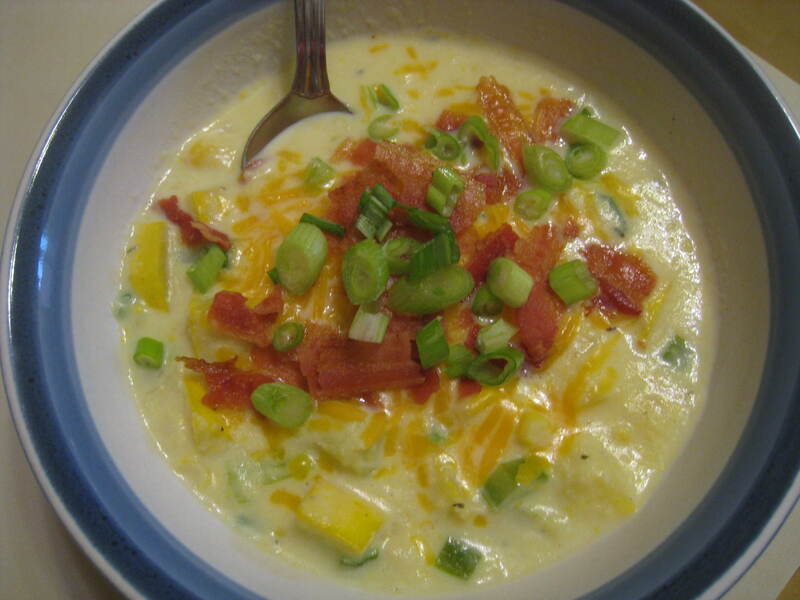 Ladle chowder into bowls and topped with crumbled bacon, cheese and remaining green onions.